Macro Musings Blog: Can Raising Interest Rates Spark a Robust Recovery? Can Raising Interest Rates Spark a Robust Recovery? Could the Fed spark a robust recovery by raising its federal funds rate target? For Bill Gross the answer is yes. He believes a key reason holding back the recovery is that the Fed is engaged in a type of financial repression where financial intermediaries' net interest margins--the difference between their funding costs and lending interest rates--are being squeezed by the Fed's low interest rate policies. He sees the Fed driving down interest rates across the yield curve and thus removing the incentive for lending. If only it were that easy. Gross is correct that higher interest rates are typically associated with strong economic growth, but has the causality backwards. The economy is not sluggish because interest rates are low. Rather, interest rates are low because the economy is sluggish. The demand for credit by households and firms simply is depressed. They see uncertainty, lower-than-expected future income paths, on-going deleveraging, and consequently have pulled back on their borrowing. There also has been an increase in domestic private savings for the same reasons. And to pile it on, there is this global shortage of safe assets problem which causes foreigners to channel their savings here too. All of these developments mean lower interest rates. It is true that the Fed's large scale asset purchases (LSAPs) over the past few years probably have lowered the risk premium on long-term yields. A spate of empirical studies, however, find that the effect of the LSAPs on long-term yields is modest at best. The LSAPs, for example, cannot account for much of the 300 basis points plus drop in the 10-year treasury interest rate since 2007. What can explain it is the ongoing slump in the economy and the global demand for safe assets. Another way of saying this is that even if there were no Fed, interest rates would probably still be very low. If the central bank does not act quickly enough – and financial conditions deteriorate further – the central bank may end up just chasing the neutral rate down without ever reaching the level needed to provide monetary stimulus to the economy. This is an excellent point, one that I want to illustrate using the IS-LM model. 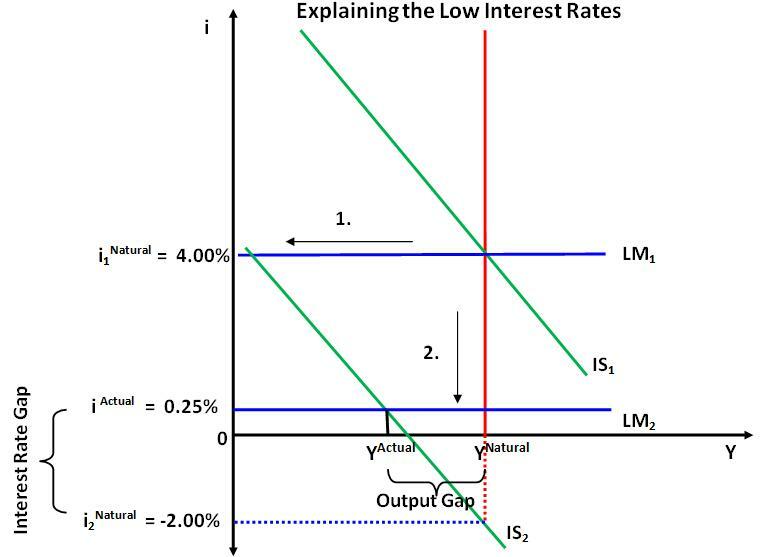 Now the IS-LM is far from perfect, but it provides a simple and systematic way to think about interest rates. Paul Krugman agrees and I want to follow up on his reply to Bill Gross with my own use of the model. 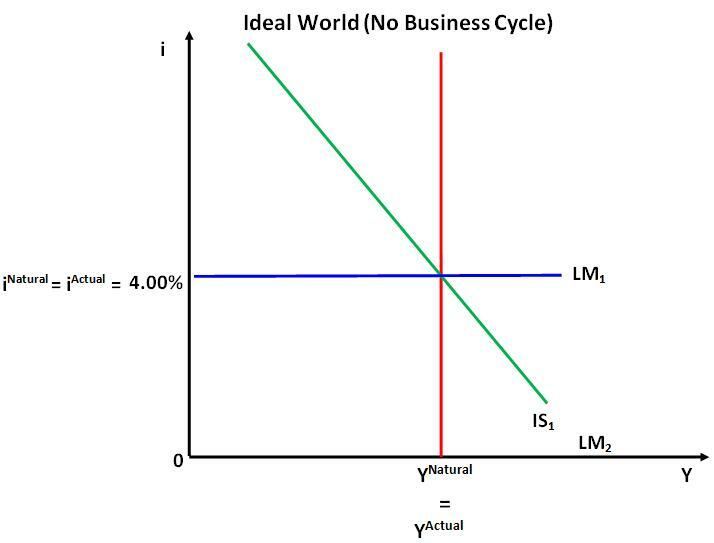 Note that in this figure there is no business cycle. Actual output is being produced its at natural rate level and consequently the interest rate is at is natural rate level too. Now imagine some negative shock increases desired saving and lowers desired investment. 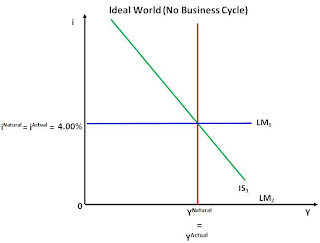 That will cause aggregate demand to fall and push the IS curve from IS1 back to IS2 as seen below. This causes the natural interest rate to fall from 4.00% to - 2.00%. The Fed, seeing the collapse in aggregate demand, lowers its policy rate to almost 0%, say 0.25%. That shifts the LM curve from LM1 to LM2. What is interesting here is that the Fed cannot lower its policy rate below 0%, yet it needs to in order to close the output gap and restore full employment. But it cannot because of the 0% bound on nominal interest rates. The economy stays in a slump and the Bill Grosses of the world conclude it is the low policy interest rates causing the problem. 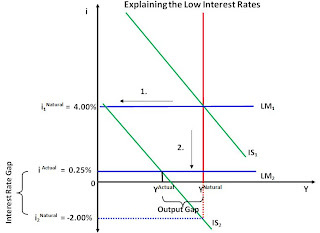 They, therefore, think the Fed should raise interest rates (or shift up the LM curve). What they fail to see is that doing so would only further increase the gap between the actual and natural interest rate. This would tighten policy and further sink the economy. Now one of the reasons I am not a big fan of monetary policy targeting interest rates is that it creates this very kind of confusion. Even if the Bill Grosses of the world did understand the above figure, it still creates the impression that once the 0% bound is hit monetary policy runs out of ammunition or at least has to switch to unconventional methods which itself can be confusing (e.g. what will the Fed do next?). Instead of creating this confusion, it would be far better for the Fed to ignore interest rates and target aggregate demand itself via a nominal GDP level target. If the Fed did, the Bill Grosses of the world would not be worked up about Fed policies depressing bank spreads via its low interest rate policy. Rather, they would be currently worked up about the failure of the Fed to restore trend nominal GDP, the true cure for restoring net interest margins. (Doing so in the model would shift back the IS and LM curves, and cause the latter to become upward slopping.) My hope is that the Bill Grosses of the world come to appreciate this point and start actively calling for a nominal GDP level target. P.S. Nick Rowe presents an alternative way to draw the IS-LM model for the current slump that is worth a look. Prices fall. Because of low prices, firms want to produce left. Clearly, the answer is to have government reverse the cut throat competition and force prices back up, right? Of course, in reality, quantity demanded would fall and production would be even more depressed. Another analogy. The demand for apples falls and government begins to subsidize apple production so supply increases. The increase in the supply of apples does lower the price of apples (as did the intial decrease in demand.) The low apple prices, due to the goverment's subsidy of apple production is caused depressed production of apples, right? Of course, that is false. The subsidy, and the associated reduction in price is associated with a larger than otherwise level of output. The Fed is lending out lots of money, so interest rates are low, so banks lend less, so there are fewer funds available to borrow, right? No! It is a failure to think about supply and demand vs. quantity supplied and quantity demanded. Gross's editorial was confusing in many respects. However, I think somewhere in there (and perhaps his other writings) is a valid point. It has to do not with equilibrium rates, but with the intensity of financial intermediation. Gross implies that much intermediation is made possible by the incentive for maturity transformation. The most important incentive (for banks and shadow banks) is the spread from overnight to 3yrs. Eliminate the spread between those tenors, and credit extended by those intermediaries should, all else equal, stagnate. The 2014 ZIRP commitment -- and not LSAPs -- is the big issue here. Would the 0-3yr curve be flat in the absence of the Fed? Only if intermediaries can meet their cost of capital with a flat curve. Sure, they can earn more by taking on credit risk instead. This gets back to "safe assets". To earn more, they need to buy "information sensitive" assets. If the flat curve persuades them to do so, great. It may, instead, persuade them to shrink their balance sheets. This inchoate excretion by an otherwise intelligent and friendly Bill Gross has certainly gotten a lot of attention. Gross seems to almost get it---the economy needs moderate inflation, he almost says it. Both now, and permanently. For a while the fed should print money and monetize debt like there's no tomorrow. QE. Get some inflation and growth going. Inflation is dead, the economy limp. Europe staggering. Is there any excuse for Bernanke's dithering? To the extent that any sovereign debt is treated as bank capital, the effect would be lower than natural interest rates, not higher. IE, absent sovereign debt (new money), banks would have to attract existing money. I'm not going to comment really on your argument (which is of course sound), but I think you're jumping to conclusions by saying that Gross has reversed causality. Read his FT piece carefully, does he ever say the Fed should raise rates? It's all musings about the zero bound for interest rates, but it makes no policy suggestions. The solution of course is to boost growth so that interest rates don't NEED to be at the zero bound. Aggressive central bank policy can get us away from the zero bound and out of the 'New Normal', ZIRP paradigm. Here in Turkey there is a fixation on interest rates, particularly among politicians, that is kind of disturbing. The current PM wants a zero (real?) interest rate policy in order to discourage the rentier class which he sees as fostering unproductive behavior("unearned income" in IRS parlance). The current deputy chairman of the dominant political party has accused "interest rate lobbyists" of conspiring against the state. I think there's a general misunderstanding about nominal and real, but in the past year the central bank has allowed 10% inflation (5% above its explicit target) perhaps to reduce ex post real interest return (RGDP growth about 8% last year, with 4% projected this year). The Fed tried that in 1931 and it didn't work. There is simply to much debt out there. Raising rates would make it impossible to service. Mr Beckworth - could you do a post showing how nominal GDP targeting goes through in the IS-LM model? Some of us oldsters reared on 1970s style macro would find this quite helpful. "Now imagine some negative shock increases desired saving and lowers desired investment." Now imagine a positive shock doing that. "What is interesting here is that the Fed cannot lower its policy rate below 0%, yet it needs to in order to close the output gap and restore full employment. But it cannot because of the 0% bound on nominal interest rates." From a medium of exchange standpoint, people need to understand what that situation is telling them. HINT: the answer is not create more debt. "Instead of creating this confusion, it would be far better for the Fed to ignore interest rates and target aggregate demand itself via a nominal GDP level target." What if higher prices lead to the same or lower real GDP and even possibly lower employment? HINT: the answer is not structural un/employment.